I discovered an amazing website just a few months ago that has kept me quite busy ever since. 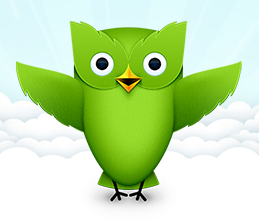 It’s called Duolingo and it’s the latest and greatest website in online language learning. The way it works is quite fascinating: people around the world translate websites in order to verify the translations and at the same time learn a new language. There are already many accepted translations of words and one must also verify current translations to further practice their reading skills. In this way the website operates freely because the learners are performing a web service at the same time. They continue adding more languages and the website even covers listening and speaking modalities. A recent study confirms the success of the website in learning a foreign language. The article is “One Per Cent: Duolingo gives language learning a jump start,” but you need an account to read the article. Whether you read it or not, I highly suggest trying it out for yourself to see what new language you can learn. I have been working on French for a while and it’s amazing to me how quickly I can learn and how well-sequenced the program is. It’s even motivational because they use points and levels much like a video game and you can follow friends to compete and keep track of each other’s progress. The article claims that on average it will take 30 hours on Duolingo to learn approximately one semester of a college language course, which is a great accomplishment. Some claim it’s even better than Rosetta Stone and of course the price comparison is a no-brainer. I want to spread the word about this and maybe even use it as a motivational tool for my students. I don’t think it can replace traditional teaching and in person interaction in all instances, but for someone who has studied a language once and knows the basics it’s easy to catch on and learn independently. Give it and a shot and let me know what you think!